Sinn Fein President Gerry Adams led a walk-out from the Dublin parliament this week in protest over the coalition government’s decision to hand over more than 700 million euro (more than 1 billion dollars) to an unknown private investor in the failed Anglo Irish Bank. There were angry scenes in the Dail on Wednesday after the 26-County Minister for Finance, Fine Gael’s Michael Noonan, admitted there was no legal obligation to refund the bond investment, which was not covered by the former government’s bank guarantee. The government has insisted the state’s reputation would have been damaged if it had failed to repay both the outstanding debt and the interest owed to the bondholder, thought to be a powerful French bank. Taoiseach and Fine Gael leader Enda Kenny defended the payment in the Dail, claiming a failure to pay the debts of Anglo Irish Bank would have angered the European Central Bank. He also said a default would have hurt the state’s efforts to get a reduction on the interest rate it pays on the bailout loans being funded jointly by the ECB, the EU and the International Monetary Fund. Mr Adams said he would not stay in the Dail while the government refused to allow a debate on the matter and led the dramatic walk-out, accompanied by the other Sinn Fein TDs and members of the United Left Alliance. In their absence, Tanaiste and Labour leader Eamon Gilmore criticised Sinn Fein, saying that the party had offered no alternative to the bailout loan facility. Mr Adams criticised the government for silencing opposition TDs on this issue and for deliberately misleading the electorate during the general election. He said there was no “political or legal or indeed moral obligation” to make the payment, and contrasted the government’s arrangements with those made in Brussels last week which have allowed a huge 50% write-down of debt for the Greek people. “At 12 noon today the government facilitated the handover of 700 million of taxpayers’ money to an unguaranteed, unsecured senior bondholder in Anglo Irish Bank,” Mr Adams said, speaking in the Dail chamber. “The government refused to convene the Dail yesterday to allow the opposition to have their say on this issue and today they wilfully frustrated a debate. “It is nothing short of a scandal that the government is allowing this handover to happen. Particularly at a time when they are planning to implement yet another austerity budget that will affect thousands of hard-pressed people. “Clearly the government deliberately misled the electorate when they promised that ‘not another red cent’ would go into the banks. He said Sinn Fein simply could not stay in the Dail during the “charade” and joined Sinn Fein elected representatives and activists who held a picket outside the parliament buildings in opposition to the payout. Mr Adams pointed out that further billions are due to be paid out in coming months. 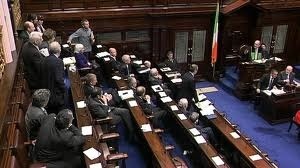 “It is not too late to stop this outrageous sell-out of the Irish people,” he said. “We are calling on people to make their voices heard, to stand up for citizens and demand that the government put people before banks. Meanwhile, there have been calls for a full, forensic audit of the governments’ accounts after a sum of 3.6 billion euro was uncovered on the books of the state’s Housing Finance Agency. The surprise discovery, amounting to 2.3% of the state’s gross national product, came as a major embarrassment to the government, which has promised fiscal rectitude while in office. Sinn Fein spokesperson on public expenditure and reform Mary Lou McDonald described the so-called ‘accounting error’ as “truly amazing”. She said the money should be used as an alternative to the austerity measures being planned by the Minister for Finance in the annual budget, due to be announced next month.